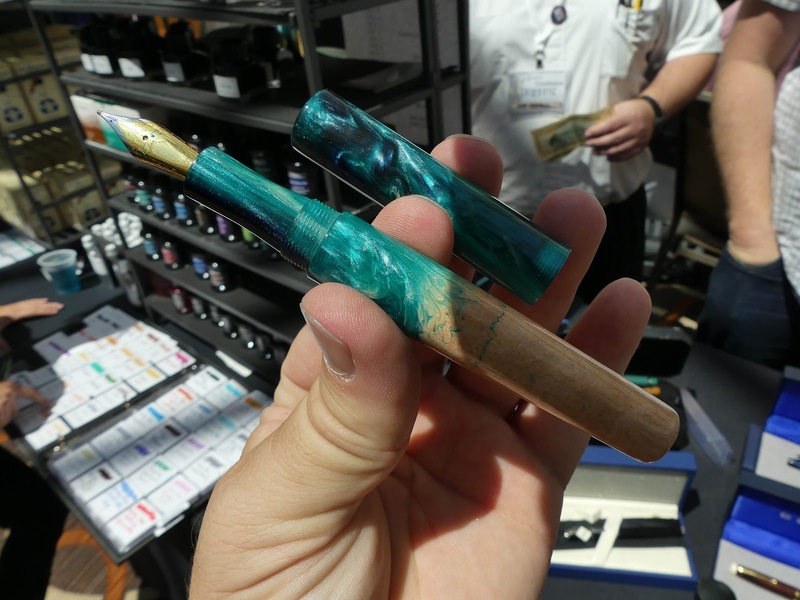 DC Pen Show 2016 Mega-Post! | Inkdependence! This was a great show, folks. So good, in fact, that I didn't manage to take many pictures of the people that I met there. That's really the best part of a show. If you're not meeting people, then you're doing it wrong. 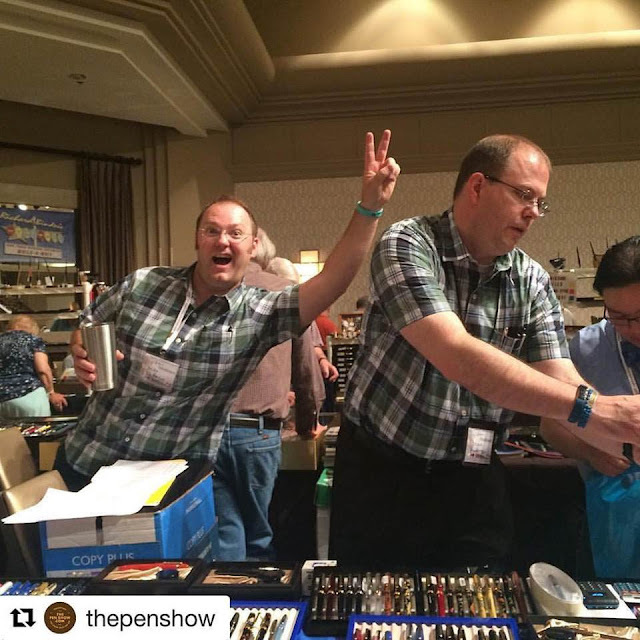 Pens and ink are great, but people are the best part of a pen show. Seriously. Unfortunately, I feel weird taking pictures of people when I could be talking to them, so I don't end up with that many pictures of people. 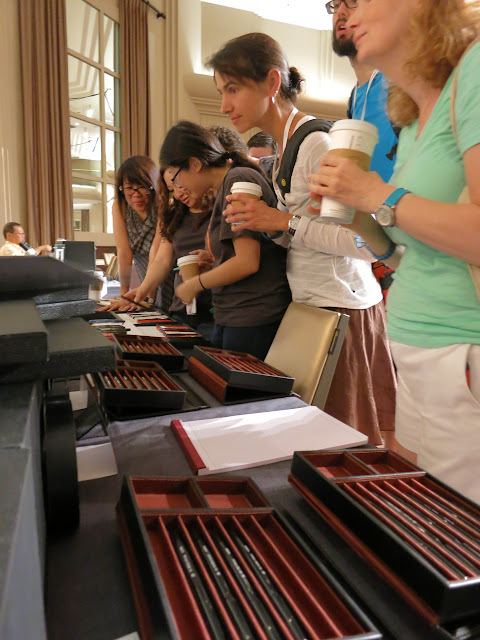 Anyway, go to a pen show and meet your fellow pen-nerds. Exchange emails. Tell a blogger that you like what they do. Hug a vendor. Make some friends! And, to all of those who came up to say "Hi!" at the show: Thanks! I know that people read the blog, but it's awesome that people can read this blog (or watch the YouTube channel) and care enough to come and tell me that they appreciate my work. So: Thanks! Okay, let's take a look at some of the stuff from the show. I'm going to mostly show new things. 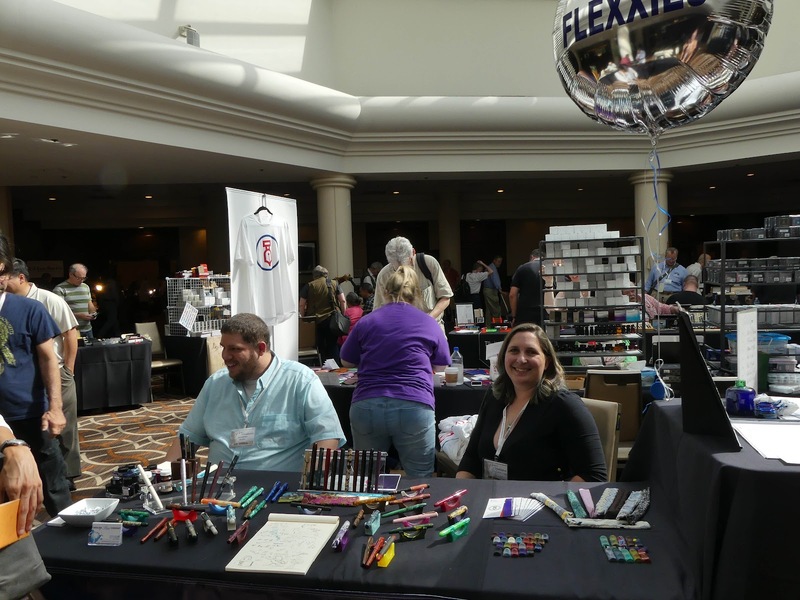 I took some pictures at the Chatterly Luxuries table (because they have amazing pens there), but none of those came out well. They were kind of in a dark alcove and my camera settings were all wrong. Ugh. Okay, so we didn't really do much at the show on Thursday. 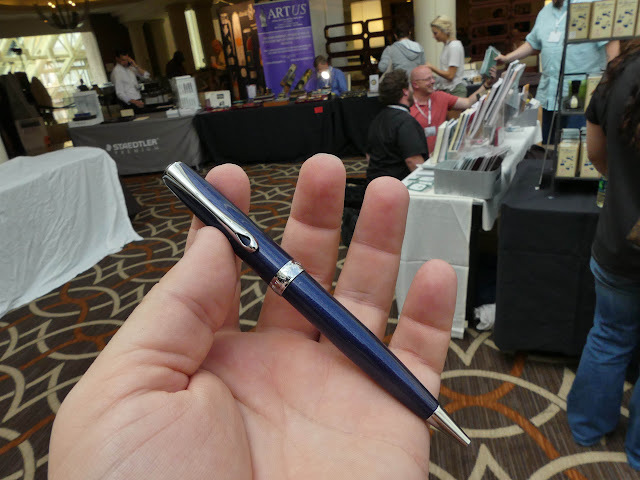 We wandered around a little bit and Audrey got a very cool pen from Jonathan Brooks (Carolina Pen Company) that she'd been wanting since she saw one like it online. I'll have a post about that one soonish (if I can get it out of her hands). No pictures! I took almost all of my pictures on Friday and Sunday. I think I took about zero pictures on Saturday. On Saturday, I was working with the Anderson Pens folks (Brian, Lisa, and Steph). 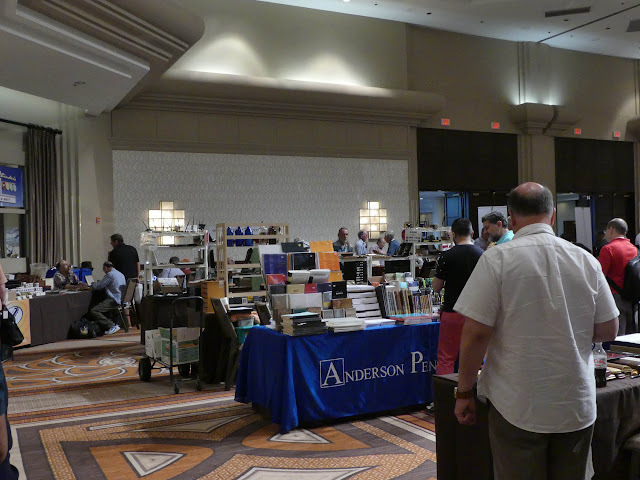 It was a bonkers day at the Anderson table, and I didn't leave the table until it was all over with. 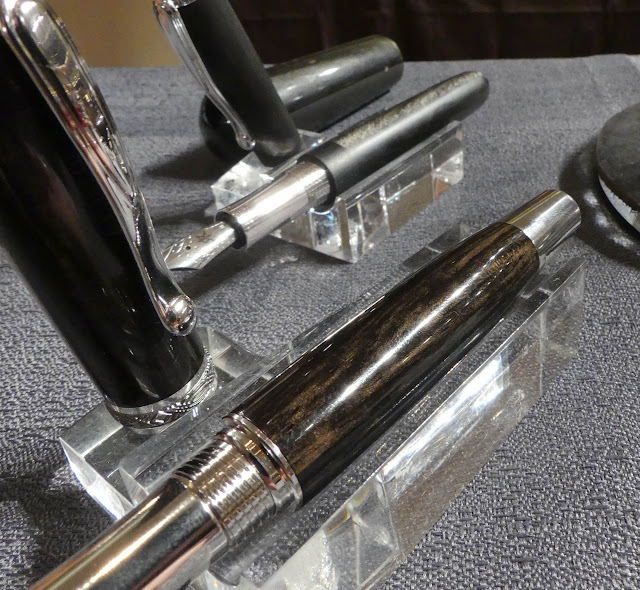 So, I was talking to people about paper, pens, and ink from about 8:30am until something like 6:30 or 7. Maybe it wasn't that late, but I kinda think it was. I didn't sit down or eat or anything else. Of course, I didn't realize that until late in the day. Too much fun, y'all. Let him know how much you like him in plaid in the comments! Okay, so I took most of my pictures on Friday and Sunday. 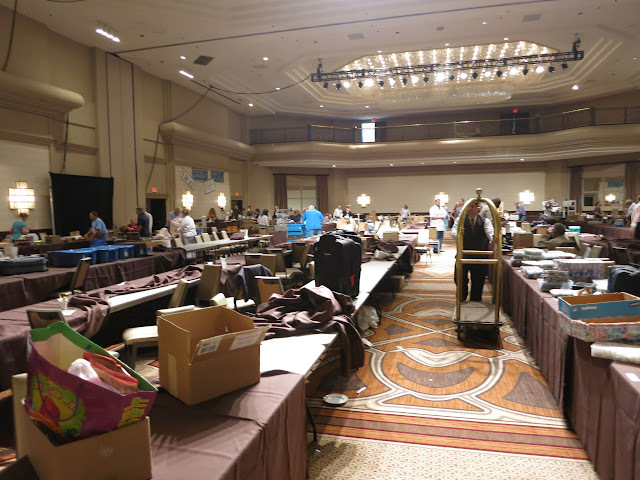 I was mostly wandering the ballrooms looking at things, talking to people, and taking pictures that day. They were good days, but I think I'm still recovering a little from them. Seriously. I've fallen asleep on the couch more this week than usual. 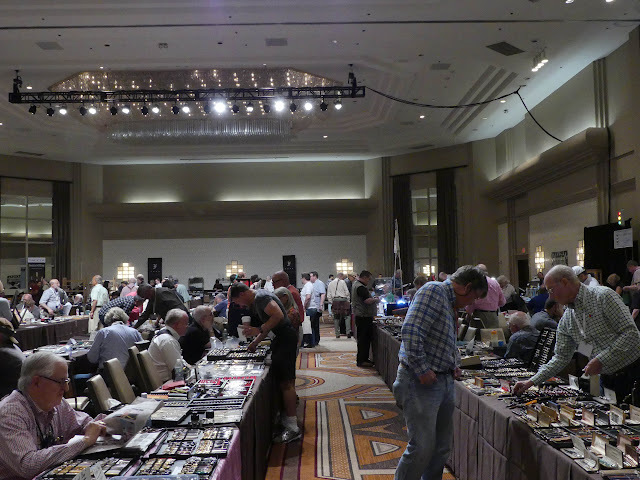 Here are a few shots of the ballroom from Friday. It wasn't a super-busy day, but there seem to be more and more people springing for the $45 weekend trader pass that lets you in for Thursday and Friday. This last one is where I was stationed on Saturday. If you were there that day and saw a guy there talking about paper, that was me. I wore that little stretch of carpet out. I didn't get a single picture of Brian, Lisa or Steph though. You've seen one with Brian in it, but none of the ones I took turned out well. Oh well. The one Suzanne caught was the best anyway. One of the most eagerly anticipated events at DC is the unveiling of Franklin-Christoph's "prototype" pens. 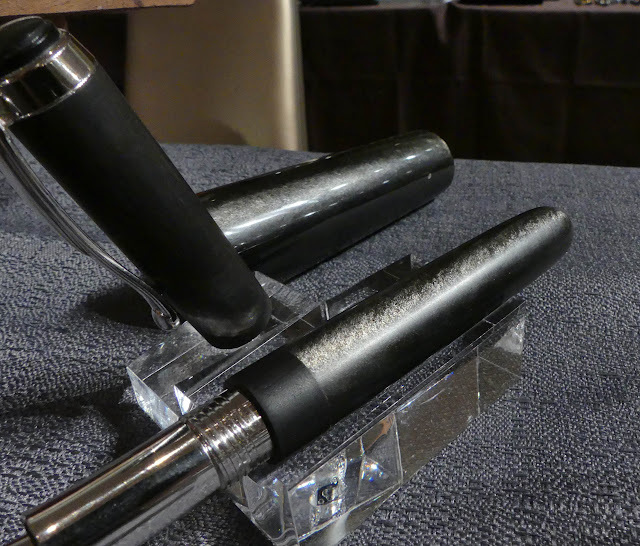 They're pens from the normal line that are produced in really small numbers for pen shows (and almost never make it to the website). Scott Franklin doesn't put them on the table until 9am, and the cool kids were circling the table and vying for positions. Intense competition. Very few elbows were thrown, but I can tell you that some of the pens didn't even make it to the table because they were snatched off of the trays as they were being put down. Feeding frenzy. Here's another bit of news: my lovely wife Audrey is going to be joining the Franklin-Christoph team starting on Monday! 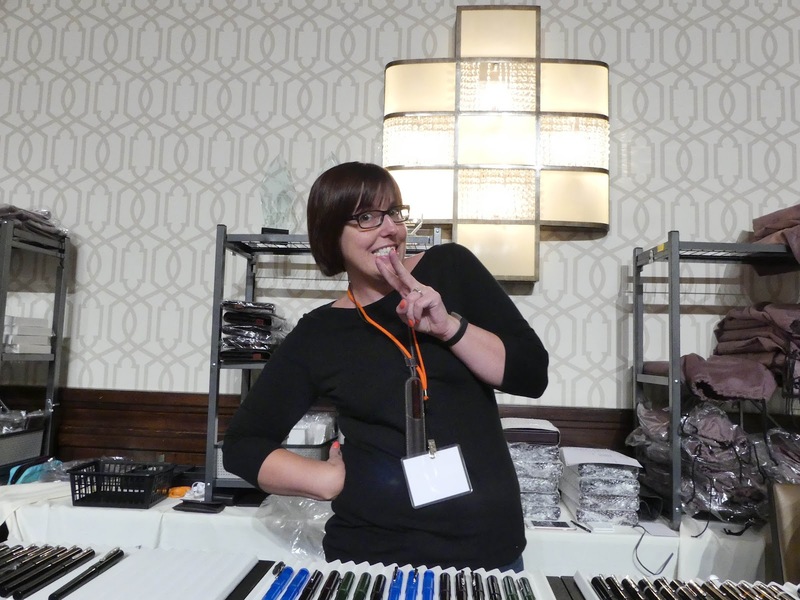 That's her in the picture below, and if you were at the show you probably talked to her about a pen or three. I'm really excited for her, and I'm a little envious of her cool new job. You'll be seeing her at shows (not all of them, but some of them) and possibly corresponding with her if you're ordering from F-C. 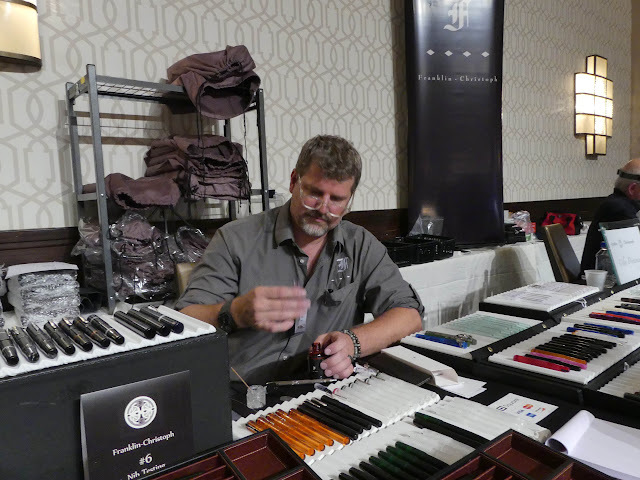 There's Scott working on setting up someone's pen at the show. I think that's a bottle of the new Urushi Red, if I'm not mistaken. I've got a bottle of that to review, and it'll be on the blog in the near future. 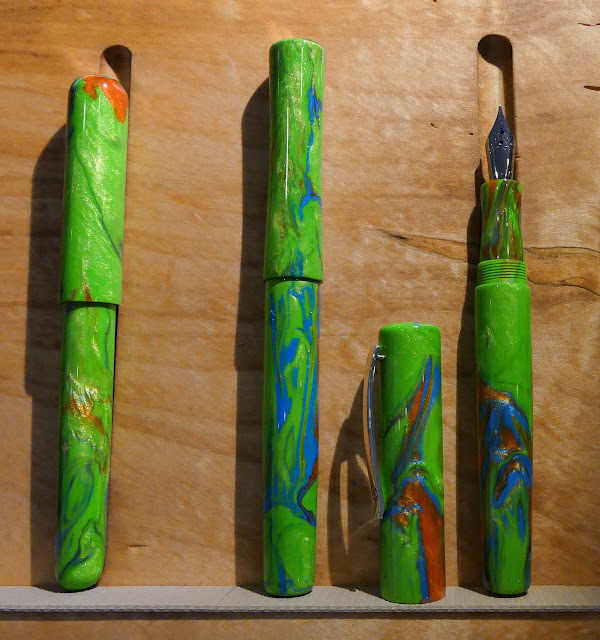 These are a few of the color prototypes that survived the initial melee. These are the ones that I was really interested in. 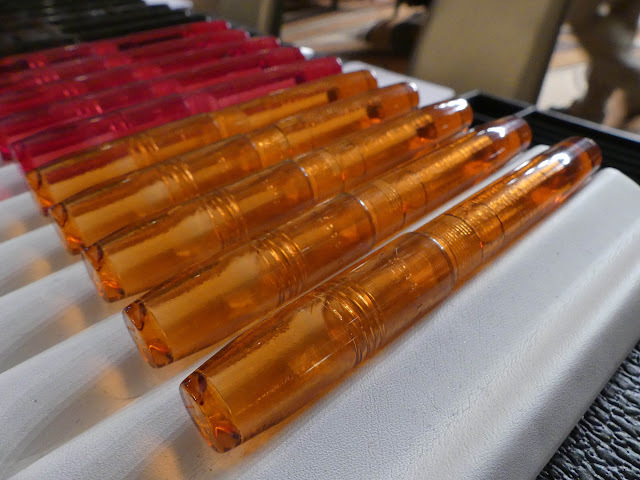 As a surprise, Scott brought a bunch of the Antique Glass and Italian Ice pens to the show. 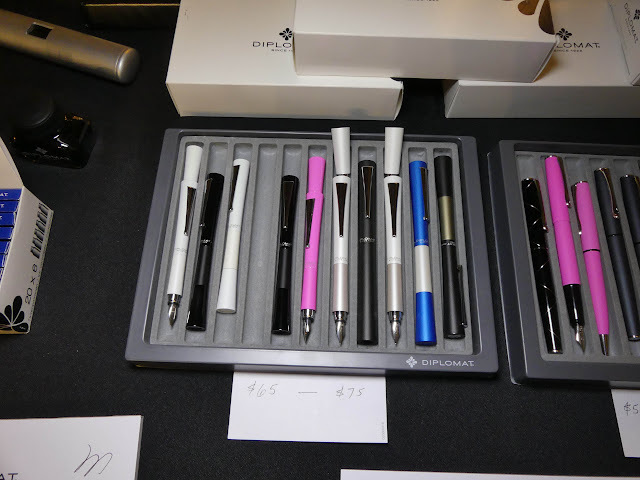 I think the Model 20 in Italian Ice is a really great looking pen, and I'm going to have to get one. 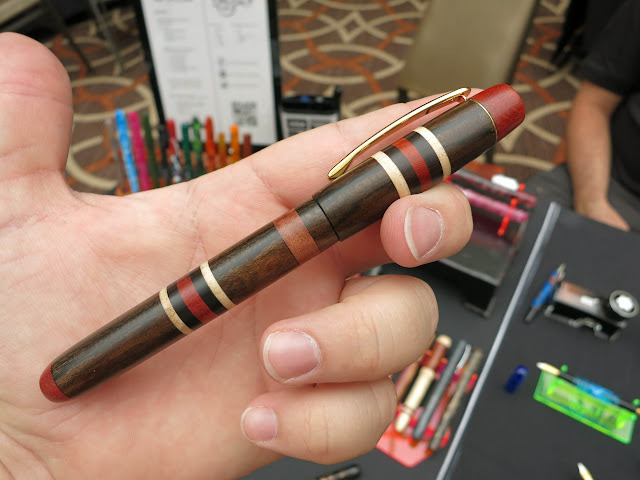 I decided to hold off on getting one at the show, but I want one soon. Maybe they'll even be making metal sections for them in the near future? I don't know, but I can hope. 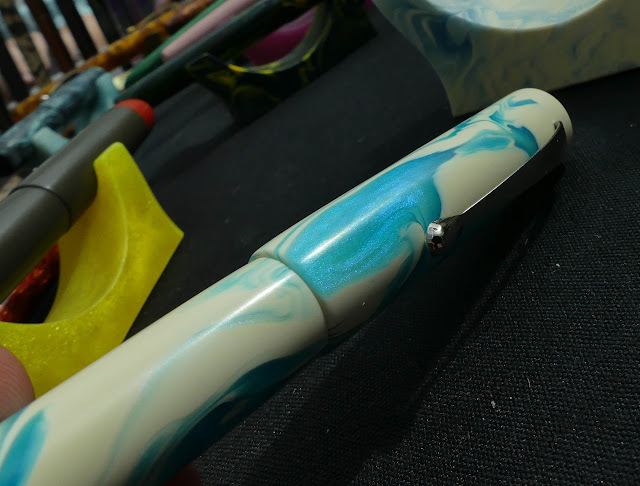 One thing that didn't come out in any of my pictures of the Italian Ice pens is that they have a very slight purple tint to them. They're not just clear plastic, they've got blues and violets in there. Perhaps you can see it in the end of the caps below? 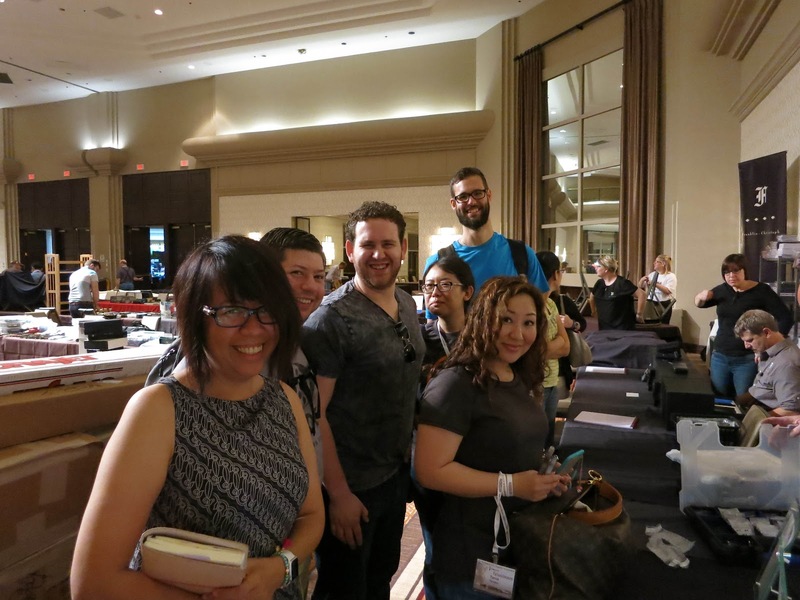 As usual, the lighting in the ballroom is weird and terrible for pictures. The Franklin-Christoph ink like is up to 14 now, and they make some of my favorite inks. Check out my reviews of these from a while back. 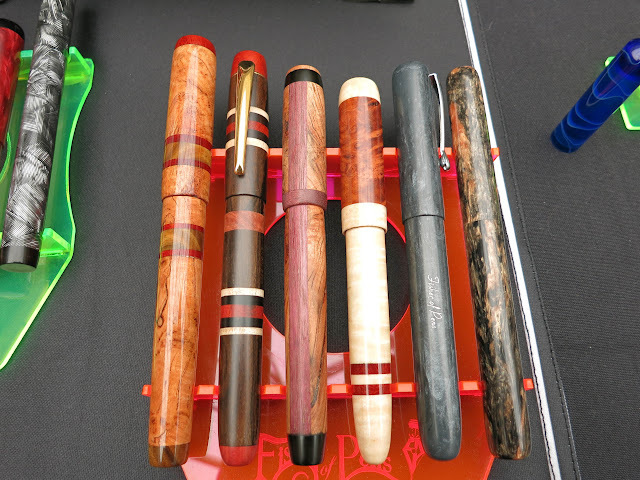 Here are a few more pens from F-C. These are all versions of the Model 45. It's a great pocket pen. 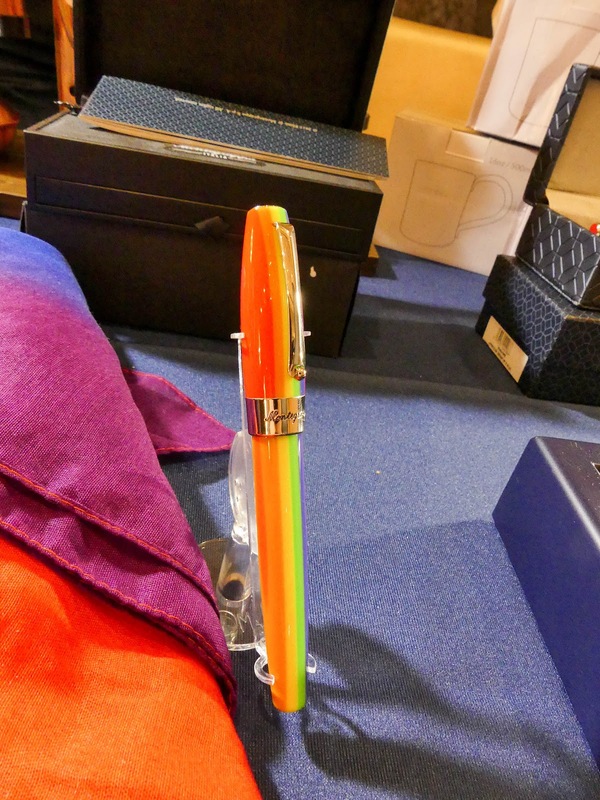 I think Audrey must have taken this picture, because I don't think I even saw these rad orange pens. It was great to meet and chat with Carl Fisher about these custom pens. He uses a lot of Jonathan Brooks' blanks for some of the acrylic pens, and they're just as cool as you'd expect. There are also a bunch of wood pens with ebonite sleeves inside that were really cool to look at. 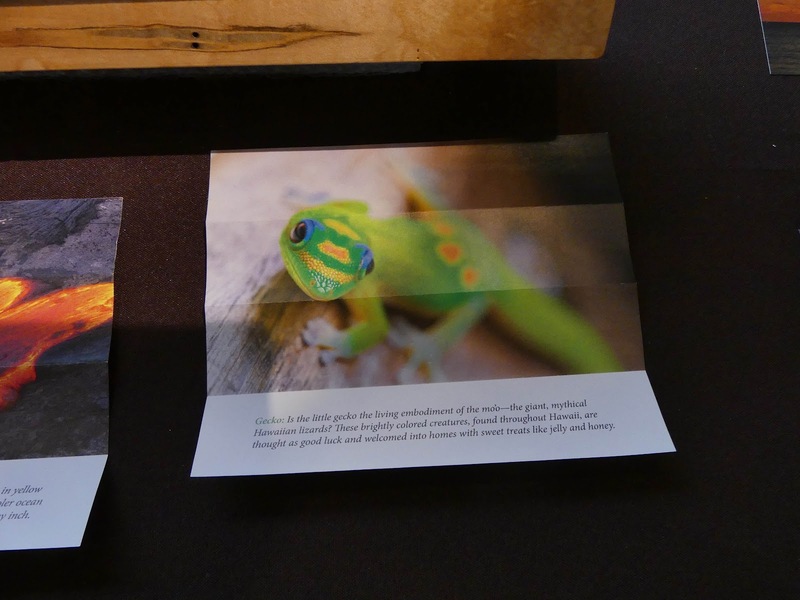 They sound like a tremendous amount of work, but the results are very cool. I think all of the wooden pens have ebonite sleeves inside, and some (all?) 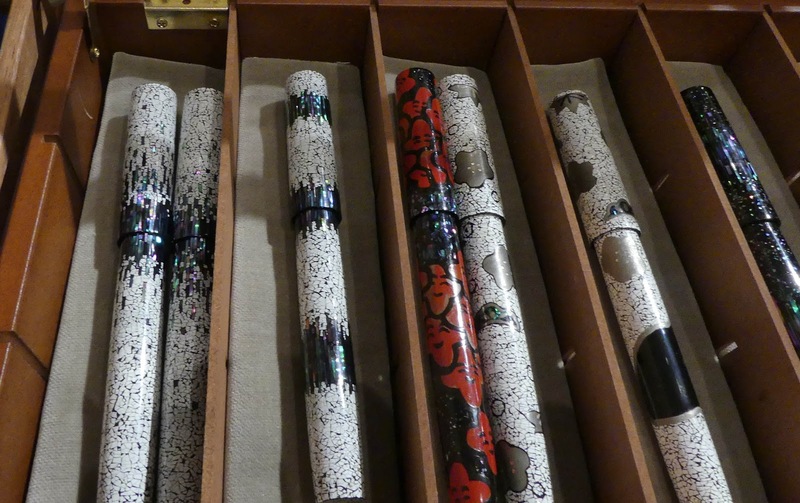 of them have ebonite sections, too. Wood and ebonite is such a good combo. 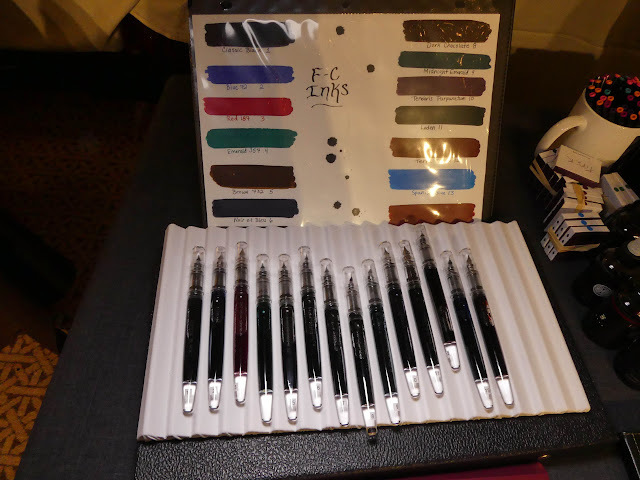 I sort of wanted all of the pens below, but I didn't get them. I'm sure they went to great homes, though. I love Ryan's work, and I have one of his pens that I keep meaning to write a post about. 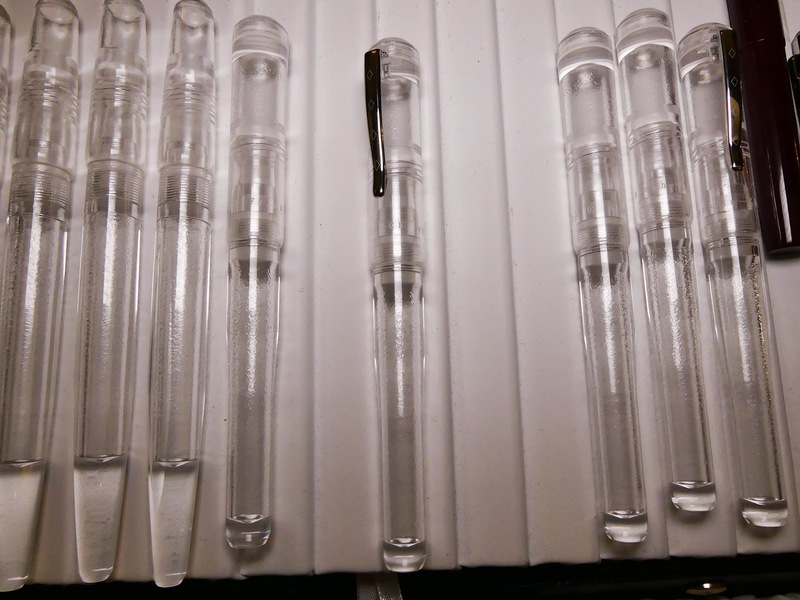 The pens directly below are a design that I've seen at a few shows, and their simple aesthetic is really attractive. No cap bands or branding. 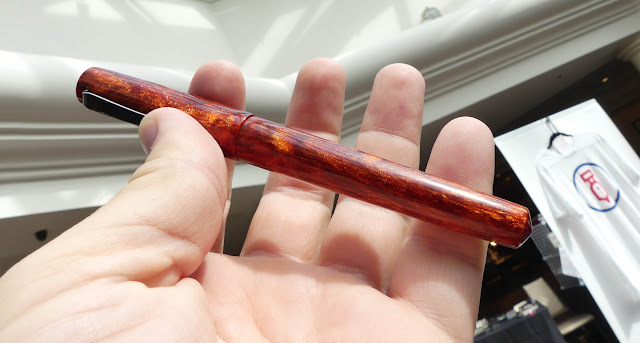 Just beautifully worked wood. 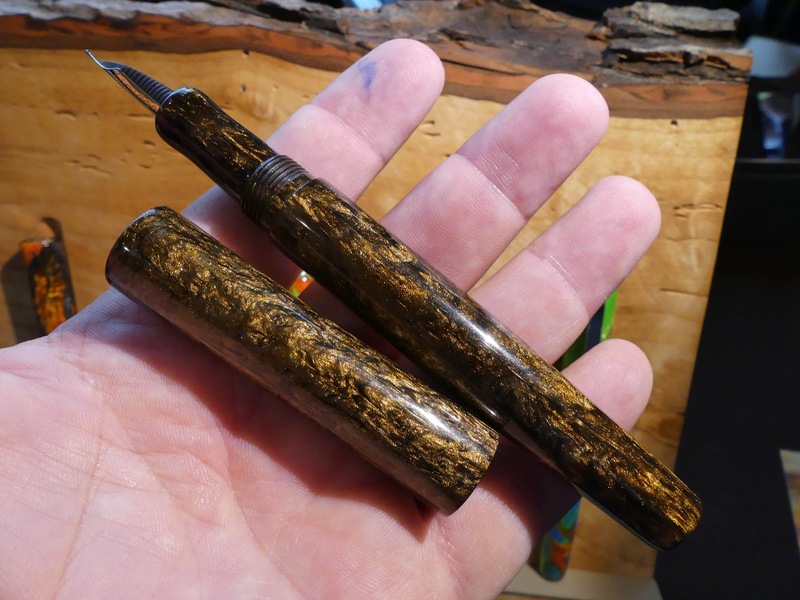 This one is (I think) made from naturally dropped moose antler. I could be wrong, but that's what most of the antler pens are made from. These next two are actually made of stone. I didn't write it down, and I can't remember what it was. 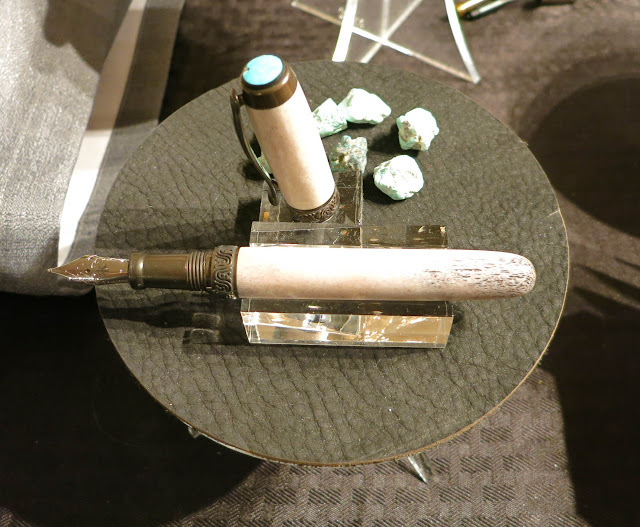 Ryan has one of the better-lit spots in the whole show, so you an see the silver and gold shimmer from these stones. Really pretty in person, and I think these pictures captured it well. 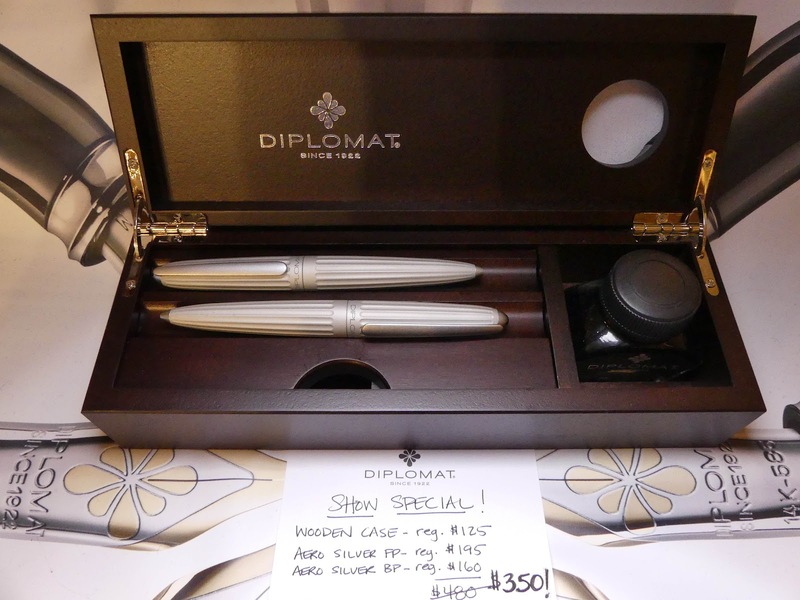 This is the new pen that Ryan brought to the show. 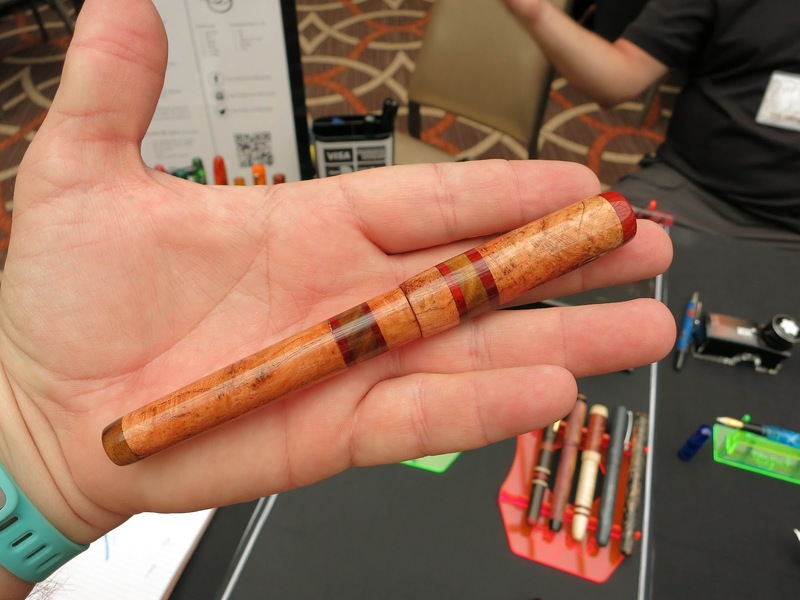 This one is called The Legend and he makes all of the parts for these pens (well, not the nib/feed), and they're various woods with an ebonite section. They actually sold out at the show, so there are a few of these floating around. Ray from FPQuest ended up with one, so check out his post. They are all cool, but the one that I really wanted sold just before I decided that I had better go back and get it. That's what I get for hesitating. I think it was made of macadamia? Anyway, I'm sure he'll have more when I see him in Dallas. At least, I hope so. I tried to get some fun selfies with Chef Brandon Lee, but I didn't manage to get any of those to come out well. The main problem is that I looked terrible in all of them. The lighting, angle, and hair-loss was a devastating combo. 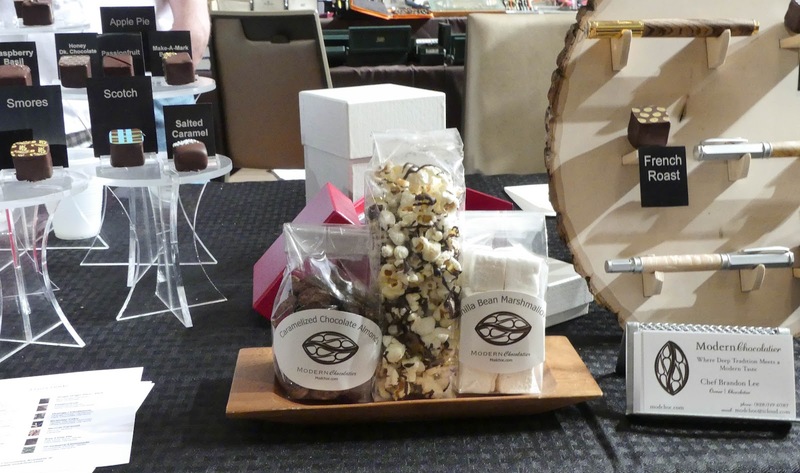 Instead, check out some new things that he brought to the show! I hear that his husband made the popcorn. Larry and Hillary (pictured below) are lovely people, and always a joy to see at shows. 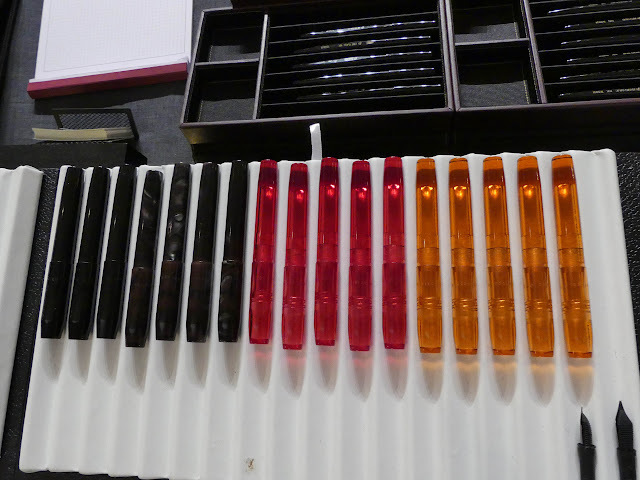 I kept meaning to get one of these Balance pens, as they're discontinued, but I didn't. I really like that blue, but it was a ballpoint so I held off, got distracted, and then didn't get one. Below is the sliver version of the Aero that I reviewed a couple of weeks back. 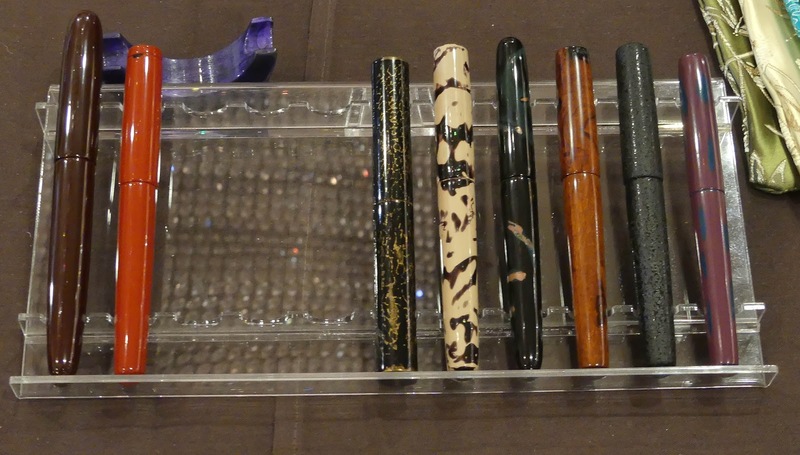 they're excellent pens, and this pen case was pretty sweet. New for this show is the blue finish in the Excellence (I think?) line. It's a deep blue with just a bit of sparkle to it. It's joining the dark green as a new finish for this summer. See anyone you recognize in the background? 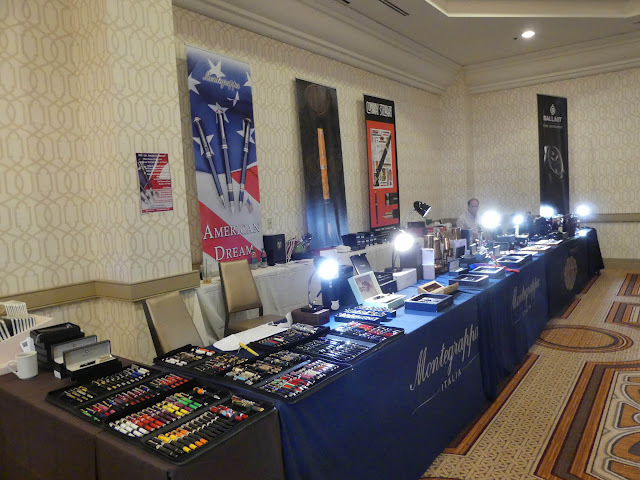 Ray is always in the same spot at the DC Show, and it's at the junction between the large and small ballrooms. 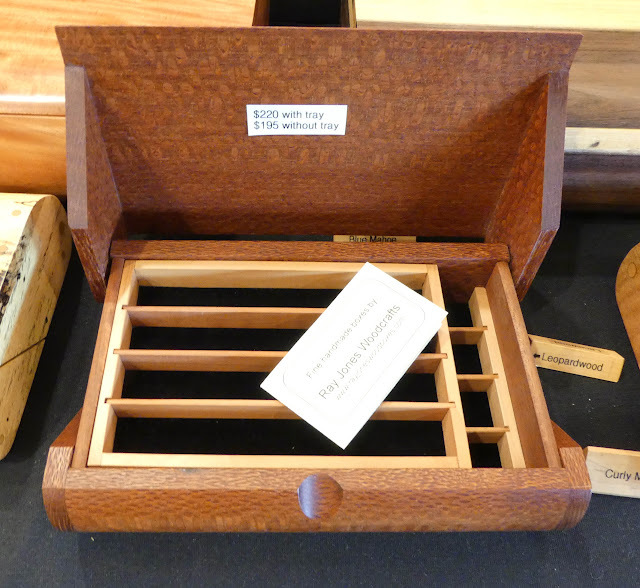 One day I'm going to break down and get one of these fantastic boxes. Go to his website to see what he does. I wound up with only one shot from his collection because my camera battery died and I forgot to take more. Our first visit of the show was the Brooks' table. Audrey got herself a "primary manipulation" pen and is very happy about it. Jonathan is super-good at making acrylics, and chances are that if you've seen a really cool acrylic pen it's made from one of his blanks. 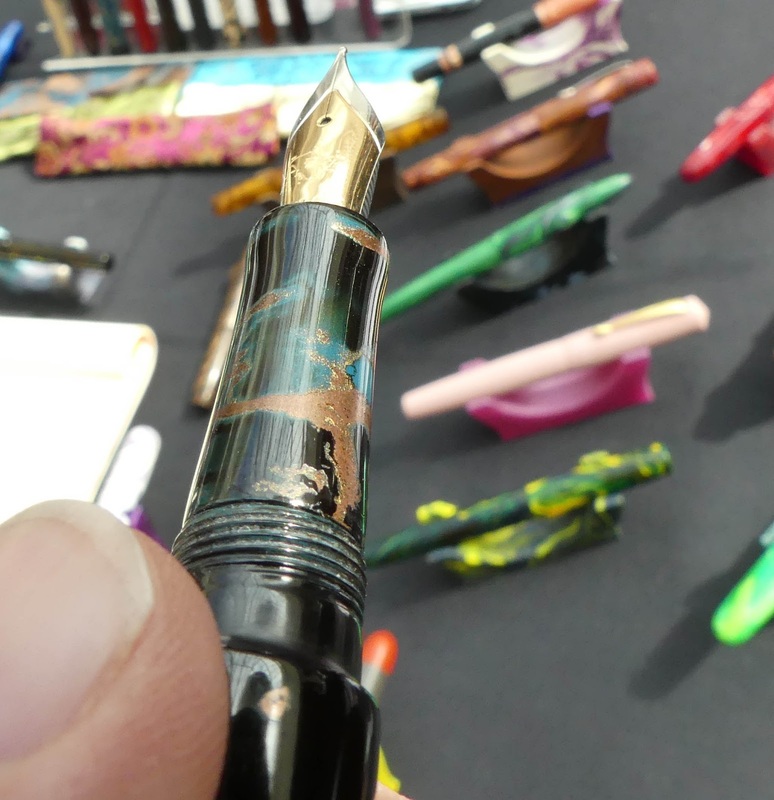 This stubby little pen got a lot of love at the show, and I think it was eventually bought by some lucky person. I think this is from a "primary manipulation" blank, too. I loved the colors, but it was way too small for me. This blue and white pen really called to me. I should have bought it. I really should have. Oh well. One of these days, I'll learn not to hesitate. 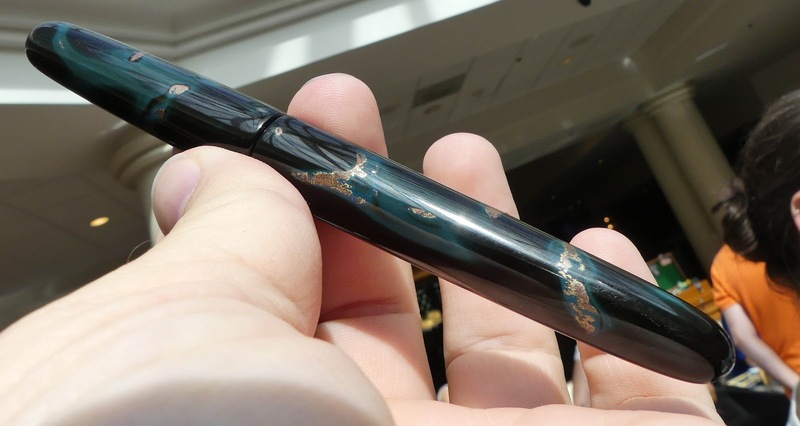 One of the simpler designs is this copper pen. I love the way it catches the light. 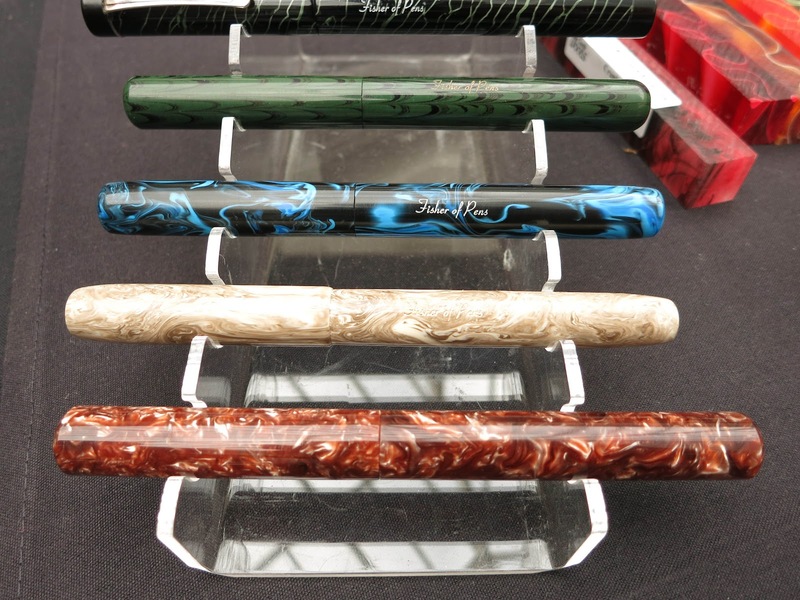 Okay, now here are the really special pens. 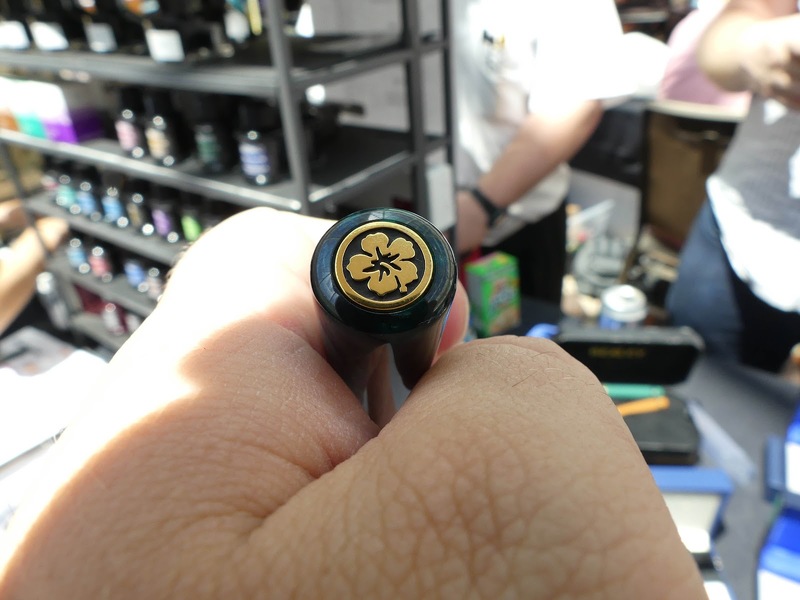 There are other brands (Nakaya and Danitrio come to mind) who are known for doing urushi laquer, but I think CPC is going to be joining those names (if it hasn't already). Just look at these things! 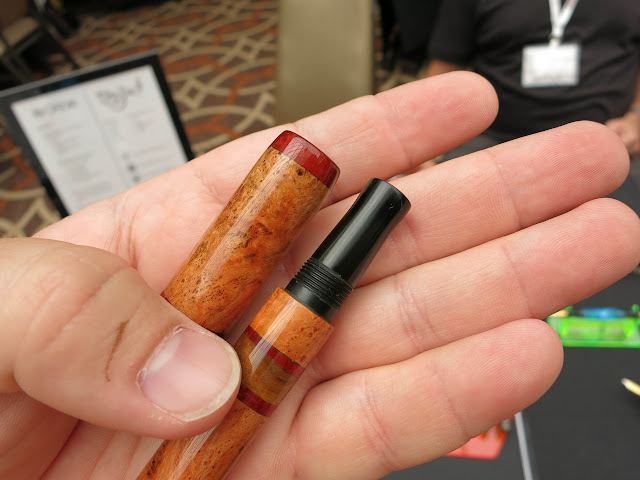 They take ages to make, and the lacquer is related to poison ivy so not everyone can make them, so the prices are high, but the artistry and the result are awesome. I love the texture on this style. So cool. 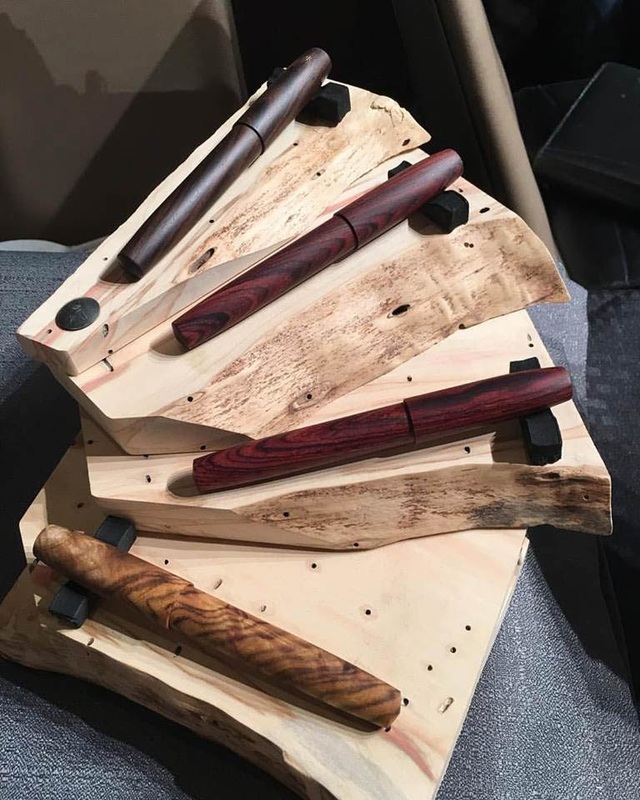 The one that looks like it's just plain wood? Nope. 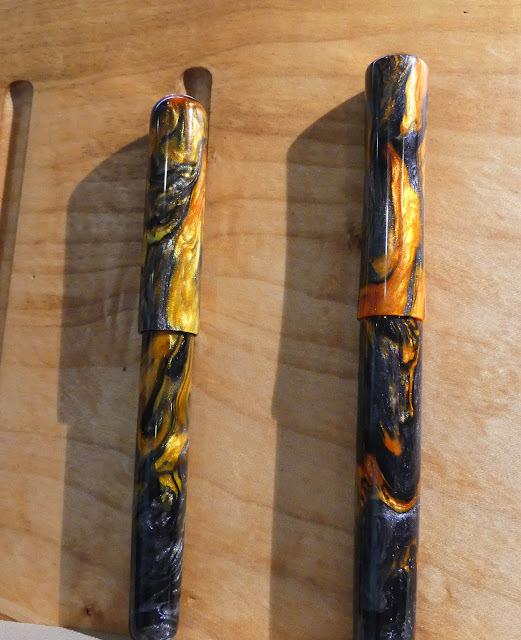 50ish coats of clear urushi. The depth that this creates is awesome. 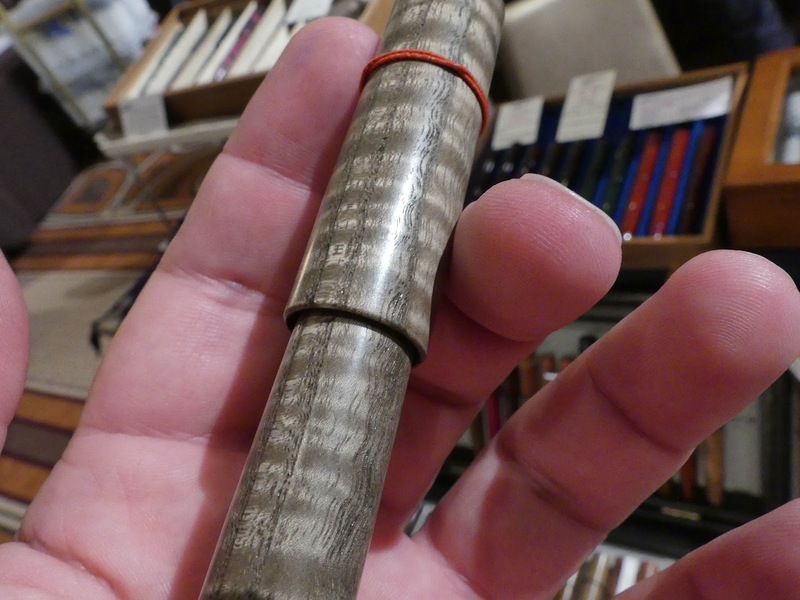 Okay, this last one isn't urushi, and I don't even know that it's a good picture. This pen is another that I probably should have bought. I don't love the gold clip (and it's a little small for me), but the acrylics used in this pen are so darn interesting that I should have overlooked that little detail. I actually took this picture in the small ballroom, which has the most terrible lighting in the entire hotel. 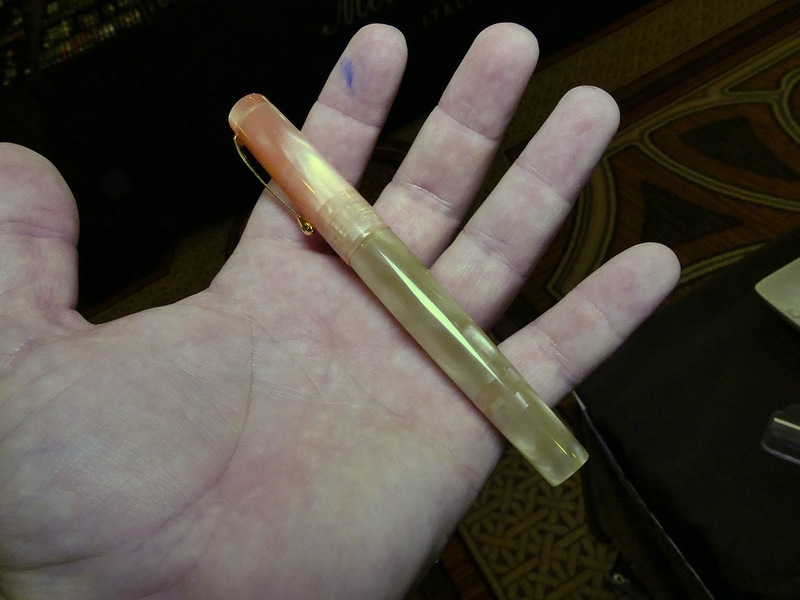 I was using a hand-held LED brick for light, and I think I caught part of the awesomeness of this pen. 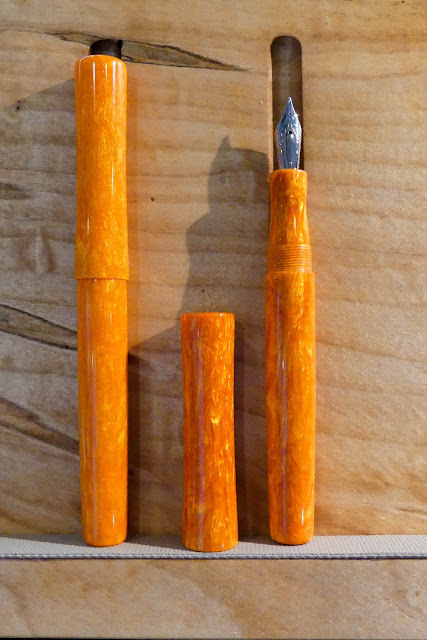 It's an extremely pale barrel with a peachy cap, and each part has elements of the other material worked in. You can just see the rings at the bottom of the barrel and the cap in this picture. As you probably know, Kenro is the US distributor for several Italian brands. 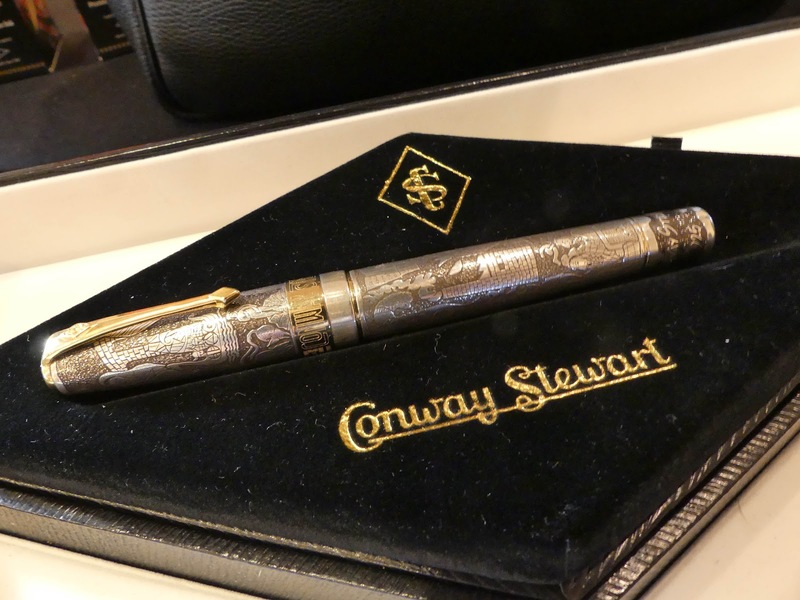 They've just picked up the renewed Conway Stewart and OMAS lines as well, so that's a good thing for everyone. 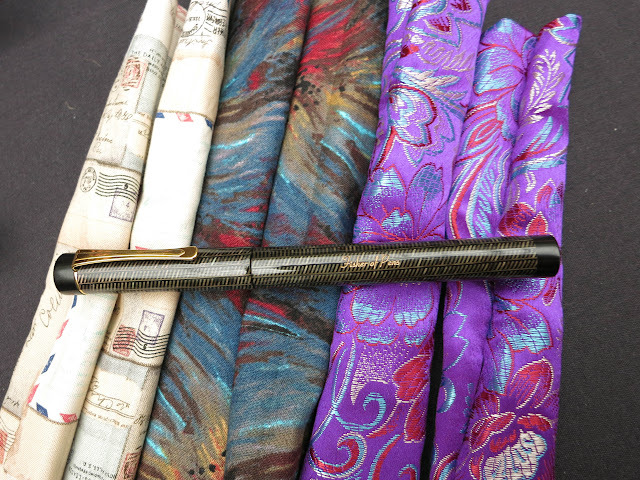 This pen is built on the Fortuna body, but that color really has a POW effect right? It's like a little rainbow right on the table. I didn't ask the price. Actually, I just want them to make one in the red and orange color. I'd probably shell out for a pen like that. They had a few of the older Conway Stewart pens there at the show, and they're a little fancy for me, but totally worth seeing. Montegrappa is always doing something interesting with their pens, and I wouldn't have known to even take a second look at this pen if I hadn't had a tour guide. The lighting is really difficult to manage in that part of the small ballroom (in fact most of my pictures were junk from that area), so the colors are all off in these two pictures. That's not the important thing, though, so I didn't mess with them. 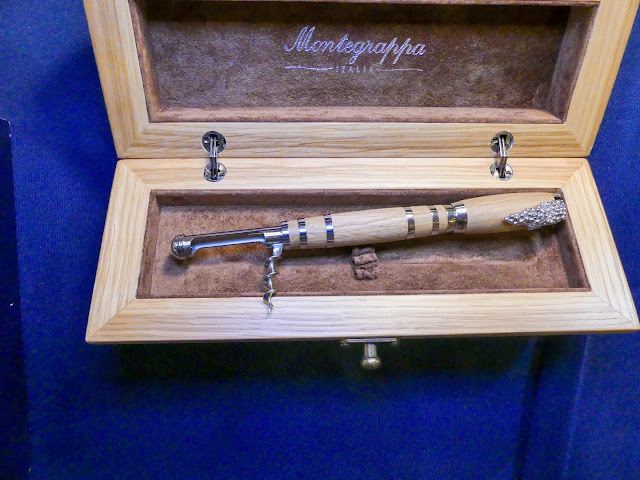 This pen has a corkscrew built into the barrel. Don't take it on an airplane. I don't even know how it holds ink. 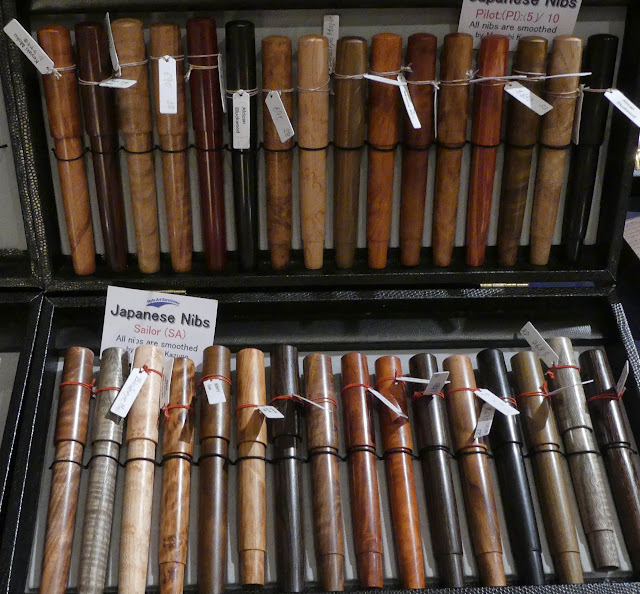 These were one of the under-cover gems of the show. 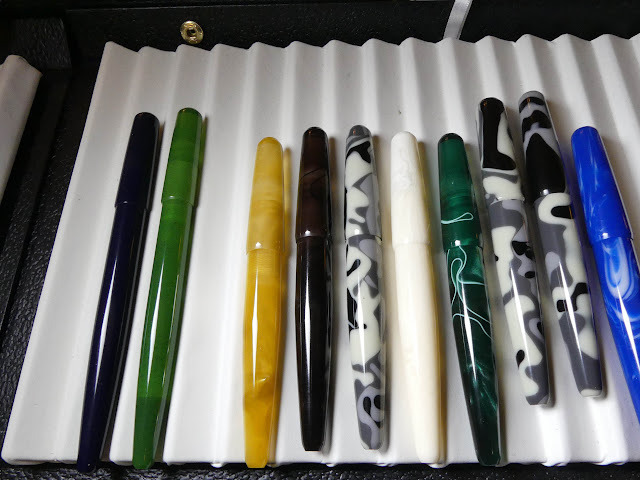 Eggshell and abalone urushi pens. Just...wow. If they look cool in pictures then imagine them looking way cooler in person. And the fact that the woman who makes these has to eat a ton of tiny eggs to get the little tiny egg shells? Mind. Blown. 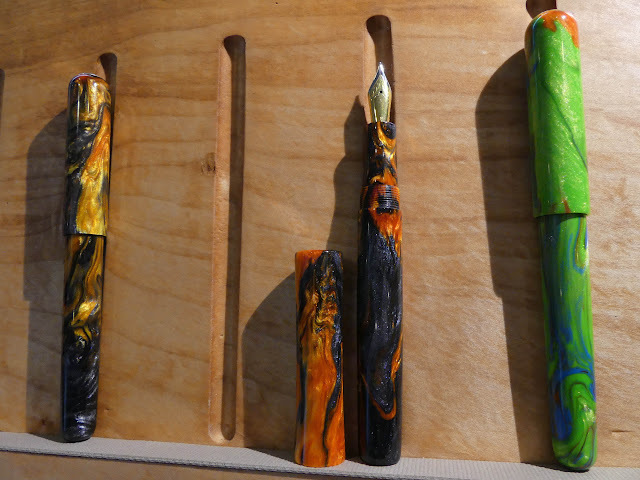 These hand-made wooden pens are also very cool. the best of the bunch is the one in the second picture. 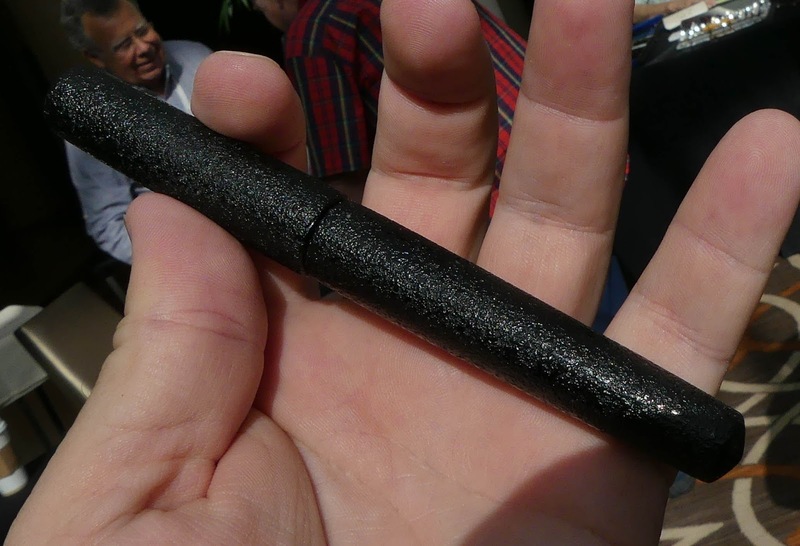 It's Japanese Ash, and it's ultra cool. 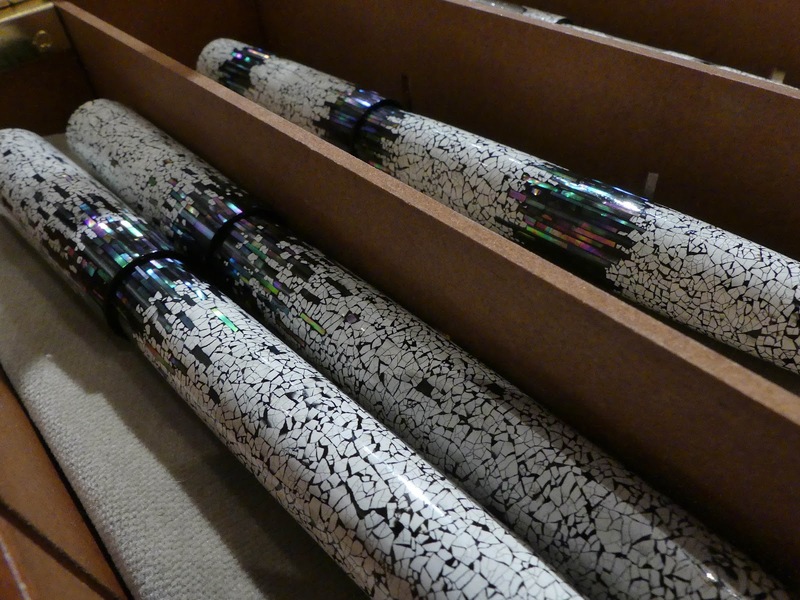 It's got a natural shimmer to it, and the bands that are shown in that picture shift as you rock it back and forth. Aw, heck. Here's the short video that I took of it. 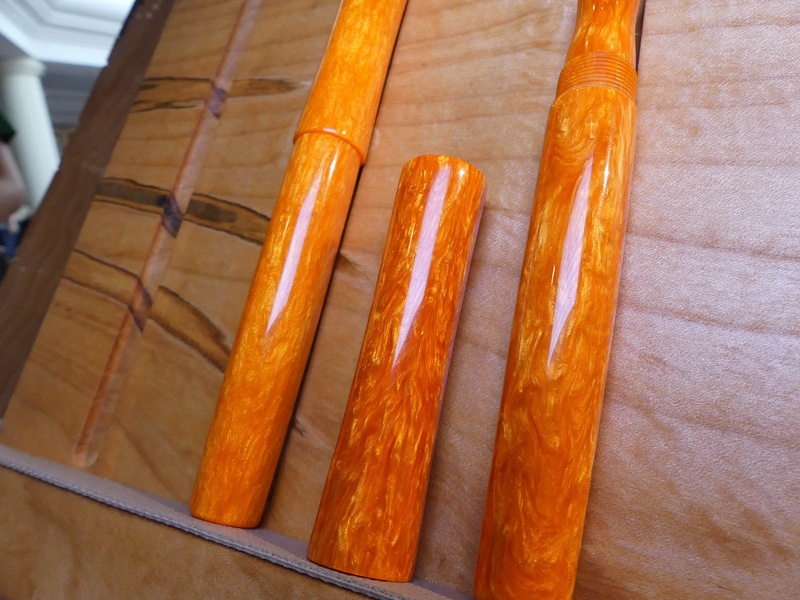 There was also a custom Vanishing Point body done with this wood. I didn't understand everything they were saying about it, but it seems that this was a piece of wood that they found that was buried for a very long time? 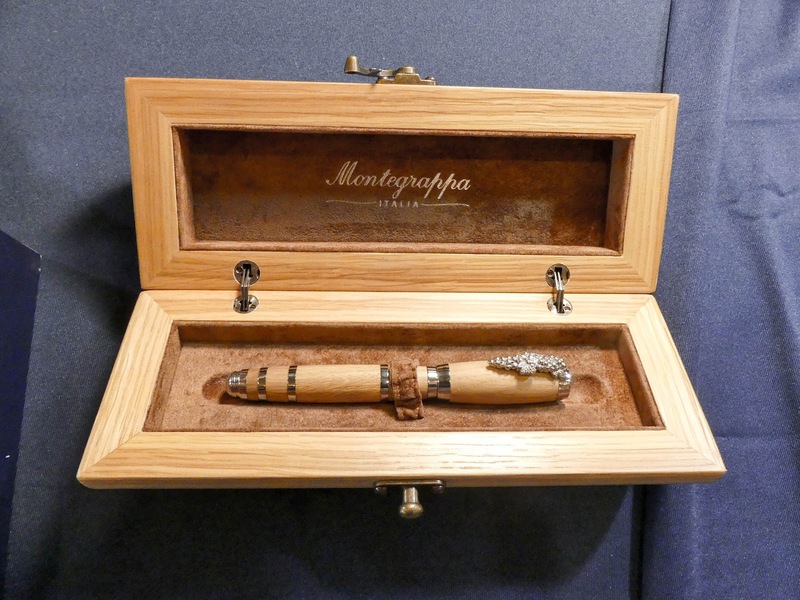 Whatever happened, this is all of the wood, and it's awesome. 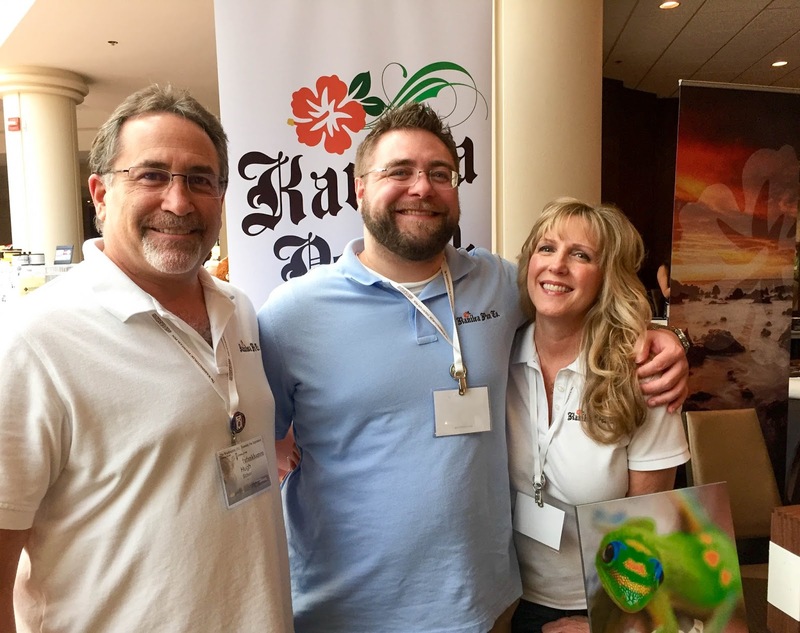 Hugh and Karol are some of the nicest people you could want to meet. Just the most welcoming and friendly people. I hadn't met them before, but you get the feeling that you're instantly family when you meet these two. I didn't get a picture of them, but here's one that Hugh sent over for me. Hugh, Matt, and Karol (respectively). 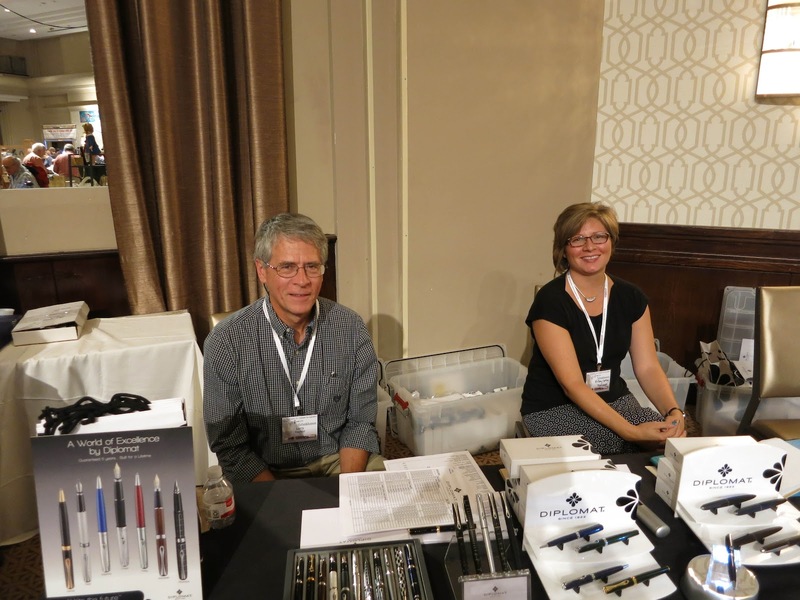 Their new venture is the Kanilea Pen Co. 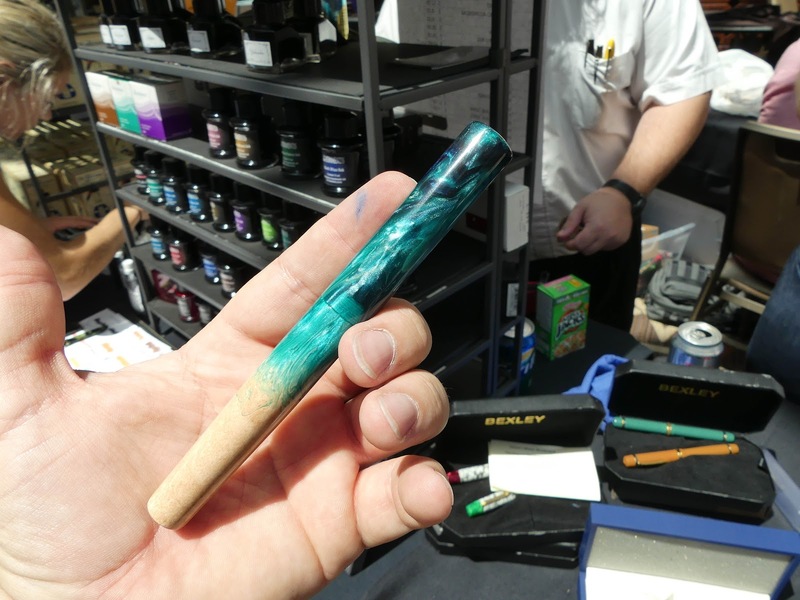 This is a brand new company, and their handmade pens were probably the stand-out of the show. You'll see what I mean in a minute. As a first outing, I don't know what they could have done better. 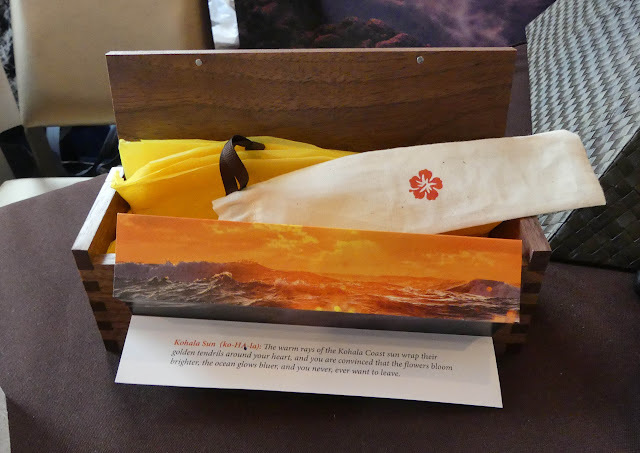 The presentation is awesome, the packaging is walnut, recyclable materials, and a belly-band that can be planted in your yard to grow wild flowers. The attention to detail is pretty stunning. The pens that they make represent the things and places that they liked most about Hawai'i. 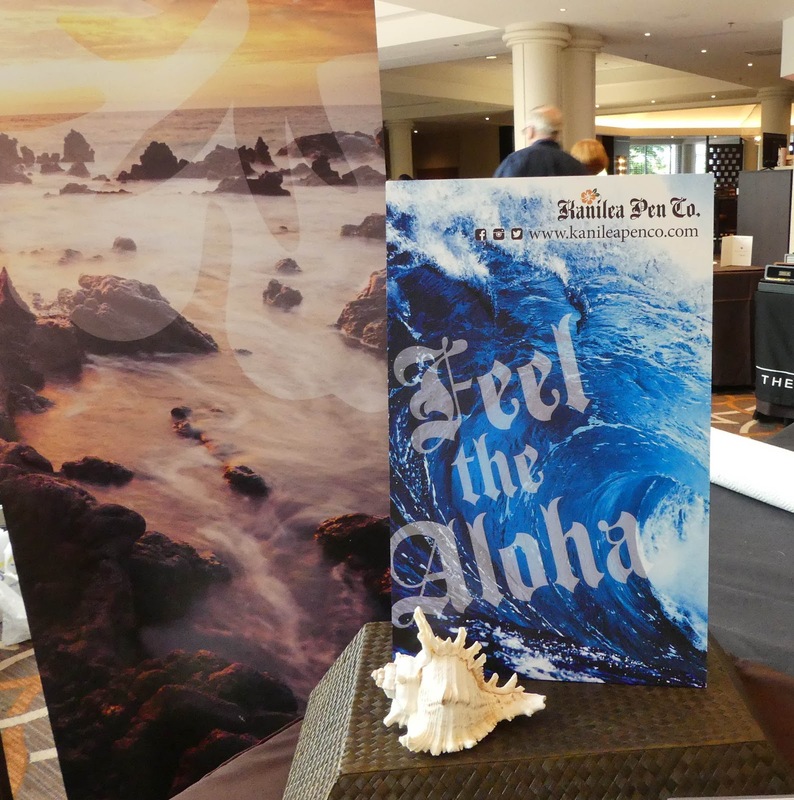 This model (the Kahakai) seems to have sold out quickly, and that's no surprise. The beach vibe you get from this pen can be felt from yards away. 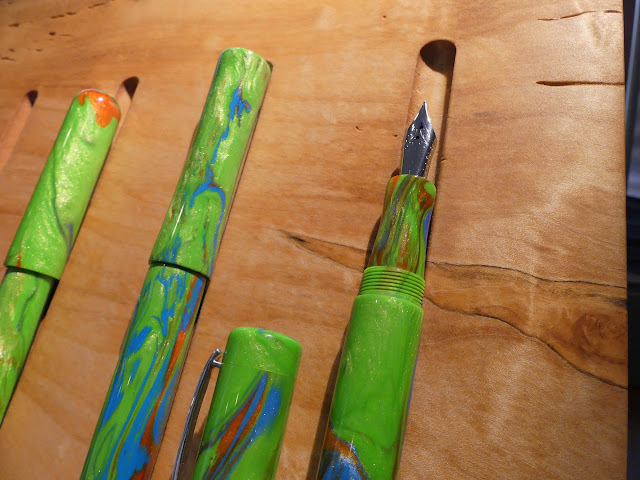 It's difficult to capture the impact of this pen in a picture, but it feels like a beach. 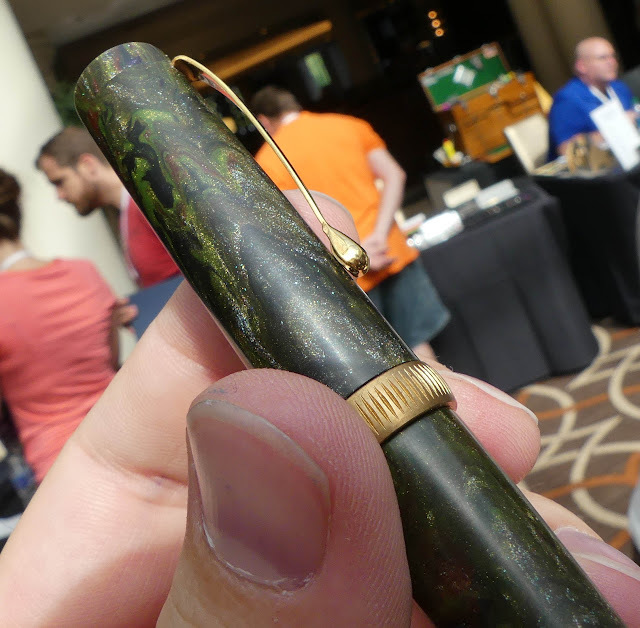 This pen belongs to Matt Armstrong, and it's beautiful. These little emblems on the finial are a really nice touch. I really like the pinched cap that some of these have. That's easily my favorite profile. I can't pick a favorite design, though. 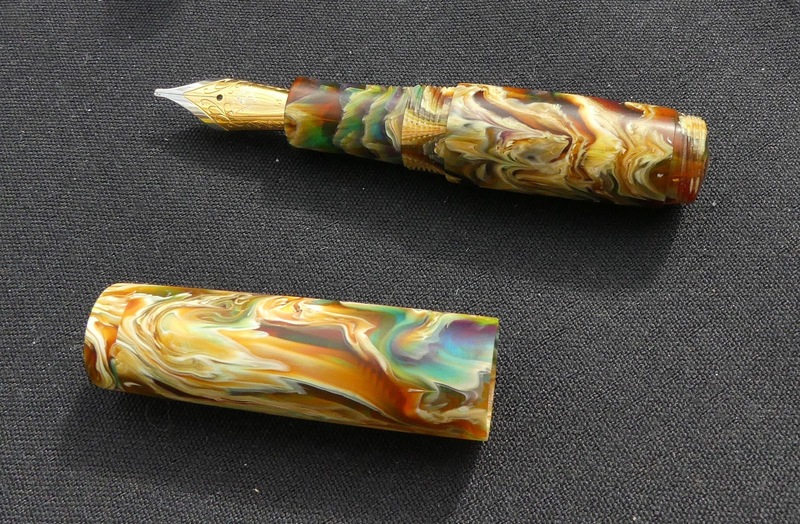 Look at the depth in these two pens. Show-stoppers. 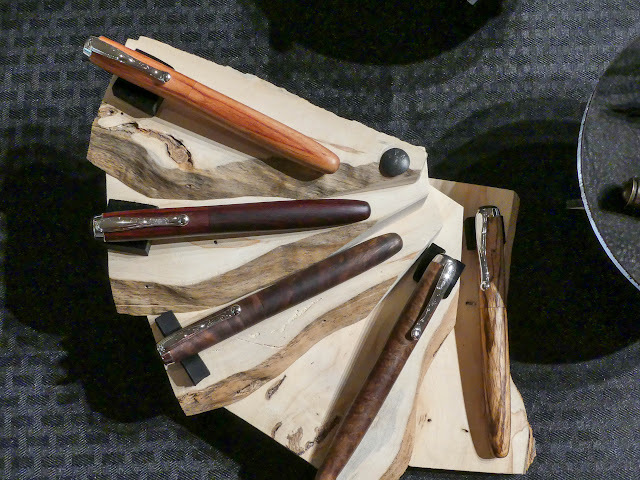 And the natural wood displays are just another testament to the attention to detail that Kanilea put into this opening weekend. Phew. That's it. That's all. I didn't get nearly as many pictures of people as I would have liked, but that's my own fault. Audrey is better at remembering to take those pictures than I am, but she's going to be working pen shows now so I'm going to have to do better. I hope you enjoyed my little retrospective on this huge show. What a terrific overview of so much of the show. A real treat for us non-attendees. Thanks so much. Thanks for the great write-up and letting us know some of the highlights.